Before moving to Seoul in 2007 I had never tasted Korean cuisine. Ok, that’s not entirely true…the week before I left a friend took me out to one of those all-you-can-eat Korean BBQ spots on Yonge Street where the food quality leaves something to be desired. I stared down at a wee bowl of kimchi, sniffed it’s funky perfume and my eyes crossed. Fast forward 12 months and I’d lived and breathed that kimchi life. In cosmopolitan Seoul, locals love for Kimchi became obvious when I was served the fermented, fishy cabbage at a fine dining Italian restaurant. In my free time I explored the peninsula which allowed me to experience a variety of regional takes on the iconic staple while skipping down to Suwon, taking the bullet train to Busan and flying to the volcanic isle of Jeju. When I found out that my cousin Chris and his girlfriend Kat regularly make their own kimchi at home I asked to tag along so I could document the process and replicate it at home. Fermented foodstuffs often overwhelm the average person…the notion of having a living thing bubbling and squeaking in your fridge can feel daunting if you can’t even manage to keep a few succulents alive on your windowsill. In recent years food writers and dieticians have been raving about the healthful benefits of fermented foods (they do wonders for your gut flora) so having a stock of kimchi in your fridge is a great way to ensure you’re getting your daily dose. There are a myriad of ways to prepare kimchi at home. In Korea you’ll find folks raving for their grandmother’s recipe (a point of pride) which is typically prepared in the Fall each and enjoyed as an annual family affair (similar to how Italians get together to can marinara each season). 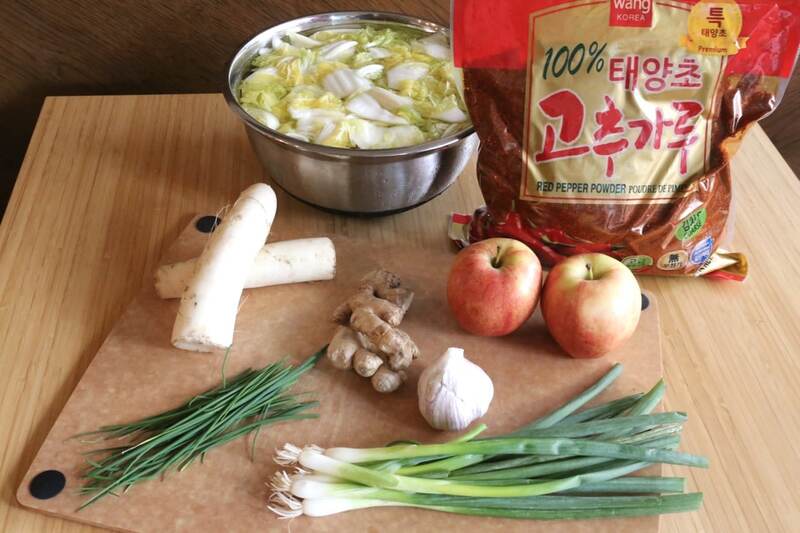 Some families prefer a salty and seafood-strong kimchi (adding a lot of fish sauce or even raw squid) while other enjoy a sweeter variety featuring diced apples and pear. Some enjoy their kimchi crunchy (best enjoyed during the first few months) while other love a funky 12 month aged version which arrives on the plate silky soft. In the recipe below I’ve used the brining method which features chopped up cabbage in a salt water bath. You can also take a more traditional approach by working with intact cabbage leaves that are individually fondled with prepared kimchi flavouring. Check out the other, more traditional method via my fave Korean food youtuber Maangchi. Quarter your cabbage. Chop into one inch pieces then place into a large bowl. Sprinkle 1/2 cup of salt onto cabbage and massage so the salt is mixed throughout the bowl. Top with cold water and let the brine rest overnight. The following day strain the cabbage and rinse with cold water. Add daikon, gala apples and green onions to cabbage bowl. Blend fish sauce, ginger, garlic, onion, Korean red pepper powder and red pepper flakes. Pour into cabbage bowl and with a large spoon mix the contents until fully incorporated. Scoop kimchi into airtight jars and use the back of your spoon (or a measuring cup) to push the cabbage into the jar so it is compact. Ensure that the brine covers the kimchi otherwise the top will go bad. 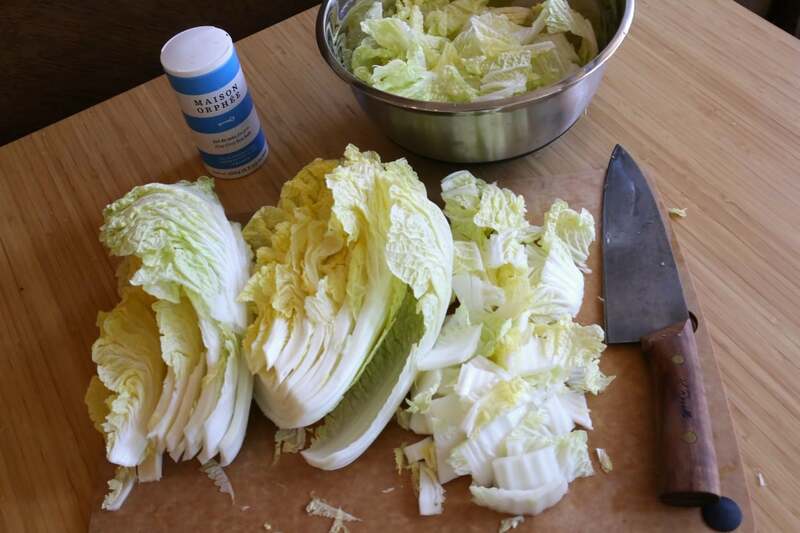 In order to weigh down your kimchi you can use sterilized weights, extra cabbage leaves, or fermentation rocks. For the first 3-5 days store your kimchi bottles at room temperature. Each morning open up each jar to ensure the build up of gas escapes (you don’t want an explosion of glass on your hands). 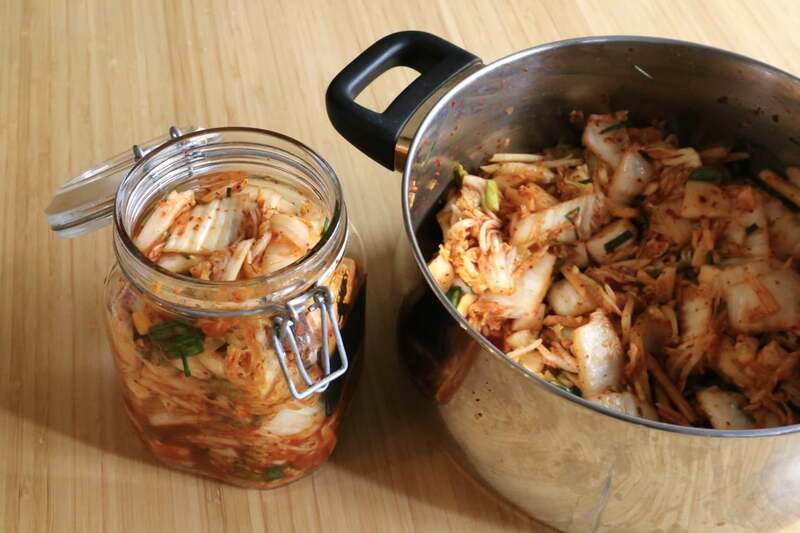 Kimchi is typically properly fermented and ready to enjoy 5-7 days. After fermentation is complete store in your fridge. Sprinkle with roasted sesame seeds and enjoy with rice, noodles and grilled meats.